Not too many hairpin-shaped routes remain in London, as there are usually unlikely to be any through passengers on such a route, and the length can make them unreliable. The fusion of two routes to make a new hairpin route in 1996 was thus quite a surprise, the only benefit I can think of being a reduction in the number of routes terminating at the crowded stand at Morden station. 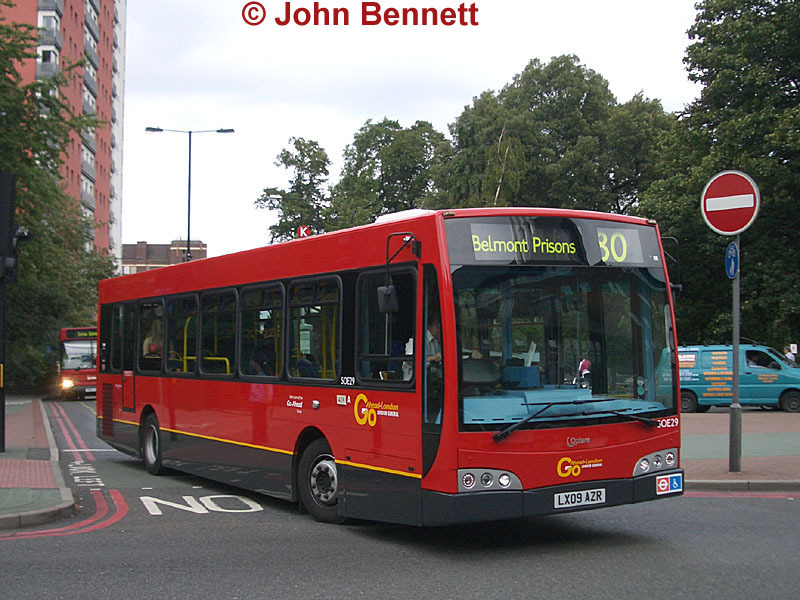 The two routes in question were the 80 (Belmont to Morden) and 393 (Hackbridge, Culvers Avenue, to Morden). 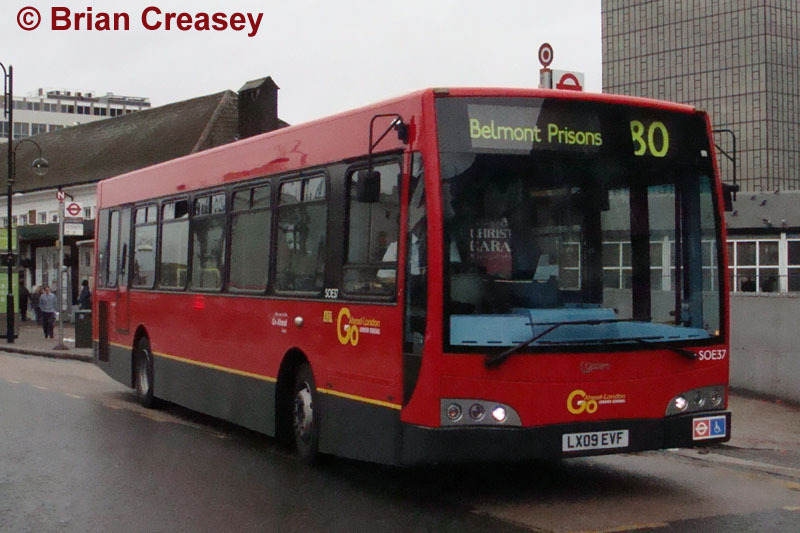 At this time, the section between Banstead and Belmont was left to the 420/440 (the 80 having also covered this during the daytime on Mondays to Saturdays), the former afternoons-only bifurcation to Downview and Highdown prisons in Belmont now becoming the daily terminus of the 80. That new contract from 1996 specified new low floor Darts, which replaced the Metrobuses that had latterly served the area. (Sutton had previously been one of the last strongholds of the DMS class Fleetline, in B20 form.) A batch of Plaxton Pointer Dennis Dart SLFs was ordered for the Sutton routes, short (9.4m) versions being specified on the 80 and 152. These early Darts proved very unreliable mechanically, and many were replaced with new ones in 2002. The 80 however retained older Darts, but received a length upgrade to the 10.2m variety displaced from the 151 and 163. 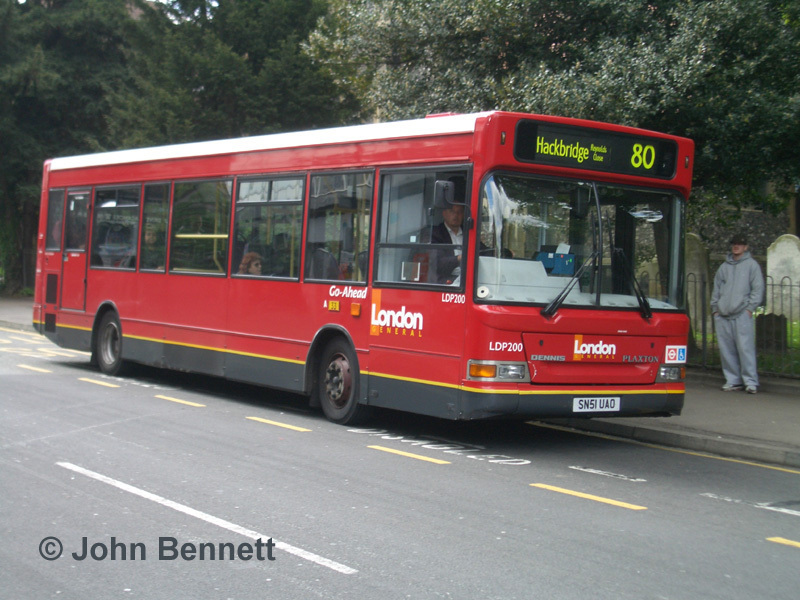 Inevitably these older vehicles would not survive the contract renewal in 2008, especially as they were single door – the decision to retain them in 2001 was a surprise, single doors having gone out of favour for all but the smallest buses not long after these were built in 1996. The new stock from 2008 has been an unusual choice, the entire intake being of East Lancs bodied Alexander Dennis Chassis. In single deck format this comprises the Esteem body on Enviro200Dart chassis, and SOE29 (LX09 AZR) pulls out of Throwley Way into Carshalton Road, Sutton, on Friday 14 August 2009. The choice of class letters is unusual, but it appears that S stands for single deck, as the Tridents taken at the same time are classed DOE. The O is presumably for Optare, which had bought out East Lancs by the time the buses were deliverted, while the E must be for Enviro, the chassis type. An odd mixture of designations in an odd order! Another view is provided by SOE37 (LX09 EVF) at Sutton station on Tuesday 3 November 2009, heading for the High Down and Downview prisons in Belmont – both were formerly hospitals. Sutton did not quite have a complete clearout of old stock, as route 413 still runs with older Dart SLFs from 2002 (there are also some PVLs and Es on route 213). In practice the Darts are often to be found on the 80 with SOEs on the 413. LDP200 (SN51 UAO) illustrates the type on Wednesday 11 May 2005 in St. Nicholas Way, Sutton – at the time this would not have looked out of place, as the scheduled Darts were similar just single doored and older! No doubt the white roof band will have retreated to the roof proper by now, and the London General logos may have been replaced by Go-Ahead London ones, but otherwise this view should be contemporary. The number 80 is unusually low for what is now a local suburban route. The 80 once had a similar structure to the 84, which still ventures out into the countryside north of London. In 1936 it started from Morden station, the furthest reach of the London Underground Northern Line southwards, just as the 84 went as far as Golders Green. Buses then ran straight down the main road through Sutton to Belmont, with a 10 minute service on offer (20 on Sundays). One bus an hour then continued to Banstead and Lower Kingswood, while another bus an hour (two at weekends) was numbered 80A and ran to Banstead and Walton-on-the-Hill, taking red Central Buses well out into the Surrey countryside. During the war, however, the 80 and 80A were diverted at the Rosehill roundabout to run to Mitcham and Tooting, replacing the 88, which was cut back for the most part to Mitcham. Meanwhile, a couple of years later a new route 151 was started, running Hackbridge (Arlington Drive) to Morden, and on to North Cheam. This was soon extended further up Culvers Avenue to Reynolds Close, the now established turning point, on an island in the River Wandle. Major changes took place in the 1968 re-shaping plans. The 213A was withdrawn between Sutton and Morden, its route via Oldfields Road, Sutton Common and Epsom Road being taken over by the 80/80A, coincidentally restoring those routes to Morden. New route 280 took over the section of 80/80A to Tooting. Additionally the 151, which by now had been extended beyond North Cheam to Sutton, Carshalton Beeches and Belmont, was withdrawn between Morden and Hackbridge, this section going to new flat fare route M1 (Hackbridge to Raynes Park). The M1 was later abandoned, and the 80/80A south of Belmont/Banstead left more appropriately to Country Buses which introduced routes 420 and 422, ultimately giving the routes described in the first paragraph.